You're quite a lovely pair and I love you two sooo much!! Awwwwwwwwwwww what a wonderful love story. Be sure you tell this one to your children as well as baby Anna. I too fell in love with Luke the first time I laid eyes on him. Although he was just a wee one of a few weeks old I knew he was someone special. This story is totally awesome. I am SO glad you shared it. 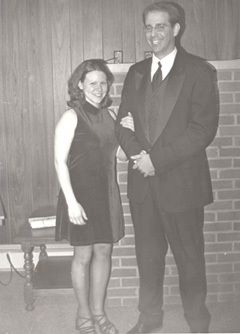 The black & white pic of you in kind of a mini-skirt and Luke in a suit with the wood paneling / fireplace combo in the background it could be from the sixties. It kind of freaked me out at first like you're both immortal Highlanders that don't age. That is a really cute how-we-met story. I did a double-take on the photo, too. What a great story! Awwwwww. Sometimes a girl has to bounce a check or two to get what she wants...right? This is my favorite story too. Awwww. And love the photo. Excuse me Ms.Frema but you yell at Sambo and I for not updating and you wrote this on Wednesday and it is already Sunday. Just think, that first day you OWNED him. hee hee hee. Did you ever Command, "DANCE MONKEY BOY! DANCE!!!"